Just like an engineer uses physics and math to create buildings, you are going to use the Physics of Dreams to bring your dreams to life. The physics of the Living Dream are somewhat different then the physics of sleeping dreams, you aren’t likely to go flying around the neighborhood anytime soon (if you do, please send us the video). This is because the Physics of the Living Dream are based on Probabilities. You may in fact fly around the neighborhood, but it probably isn’t going to happen. Einstein said,“In all the Universe, the single most powerful force, is the property of Compounding.” This is how millions of bricks add up to create a Cathedral, or how years of exercise add up to create a healthy body, they Compound on one another. You may not immediately be able to build an entire Cathedral, but with a little focus, you probably can manage to make a brick. 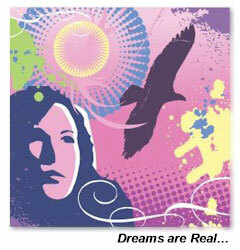 In using the Physics of Dreams, you will want to find “Manageable and Completable, Units of Success”. We want the Universe to work with you, so you’ll need to break large goals into smaller ‘highly probable’ successes. Then all you’ll have to do is assemble them. A few pages ago I spoke of how the great divide between Faith and Proof has stretched into the world of personal development. This divide has created two mindsets: The Spiritualists and the Technologists. This tool is all about creating a Unified Perspective, from which to begin building you dream come true. If the Scientific Community and the Churches can reunite after a 2,000 year old quarrel, what about the world of personal development? The first thing to understand is that Science, at its very core is a predictive art form. The science of Gravity allows us to predict how fast an object will fall. If it makes good predictions its good science. Quantum Physics, although very odd by traditional standards is extremely good at making accurate predictions. So good, that it has replaced the old ways of viewing reality.